These essays in constructive Christian dogmatics treat a cluster of themes: the nature of Holy Scripture and its interprtetation; the place of Jesus in modern intellectual culture, and in theological depiction of the nature of the church; and the inseparability of theological and moral reflection.An important series of esays from one of the world's leading contemporary theologians. 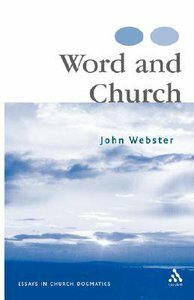 Professor John Webster (PhD, DD, FRSE) is Chair of Systematic Theology, King's College, University of Aberdeen. An Anglican Evangelical scholar who has had a distinguished career as a professor at the Toronto School of Theology, and seven years as Lady Margaret Professor of Divinity at the University of Oxford before coming to Aberdeen. He is a prolific author and editor with expertise on Barth and Jungel, some his recent titles include: The Cambridge Companion to Karl Barth (Cambridge University Press, Cambridge, 2000), Barth (Continuum, London and New York, 2000), (translated with an introduction) Eberhard Jungel, God's Being is in Becoming. The Trinitarian Being of God in the Theology of Karl Barth (T & T Clark, Edinburgh, 2001) Word and Church. Essays in Christian Dogmatics (T & T Clark, Edinburgh, 2001) Holiness (SCM Press, London, 2003/ Eerdmans), Holy Scripture. A Dogmatic Sketch (Cambridge University Press, Cambridge, 2003), Barth's Early Theology (T & T Clark International, 2004) Confessing God. Essays in Christian Dogmatics II (T & T Clark International, London, 2005). His future project include preparing the volume on Ephesians (Brazos Theological Commentary), a multi-volume systematic theology and with Professor Iain Torrance and Professor Kathryn Tanner, editing The Oxford Handbook to Systematic Theology. Acknowledgements; Introduction; Scripture; 1. The Dogmatic Location Of The Canon; 2. Hermeneutics In Modern Theology: Some Doctrinal Reflections; 3. Reading The Bible: The Example Of Barth And Bonhoeffer; Christ And The Church; 4. Incarnation; 5. Jesus In Modernity: Reflections On Jungel's Christology; 6. The Self-organizing Power Of The Gospel Of Christ: Episcopacy And Community Formation; 7. Christ, Church And Reconciliation; Ethics; 8. God And Conscience; 9. Eschatology And Anthropology; Index Of Names.